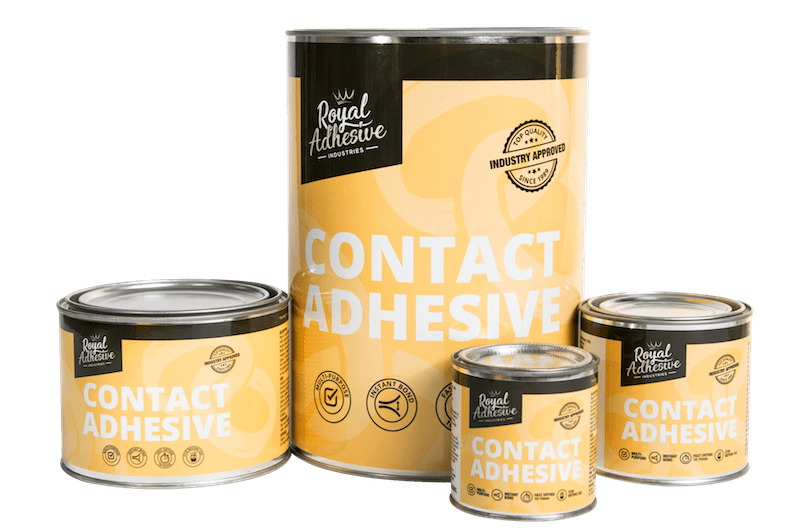 Royal’s Contact Adhesive is the most multi-purpose contact adhesive for your bonding needs. This product offers durable final bonds that are fast and flexible, with good water and heat resistance. For those hard to reach places, this Contact Adhesive offers you excellent brushability, ensuring you experience an easy application. NOT SUITABLE for polystyrene. DO NOT use as a structural adhesive. Stir Royal Contact Adhesive well before use. Ensure that both of the surfaces to be bonded are clean, dry, and free from any dust or oil. If the surface is very smooth, it may first require roughening with sandpaper. Use a serrated scraper or brush to apply a uniform coat to both surfaces and allow to dry for approximately 10-15 minutes. This product has an open time of 20 minutes, allowing sufficient time to line up both surfaces. Once aligned, apply an even pressure to ensure a permanent bond. Applying clamping and some heat can have an improved effect in your final bond strength. You will cover approximately 2-3㎡ per litre, for double-sided applications. Use Royal Cleaning Thinners to clean off excess adhesives and applicators.